We visited the land of Samer Shahdah Abu Asara, a Beit Ummar farmer who owns land directly next to the illegael Israeli settlement of Efrat. In part of his land he used to grow grapes. Another part, 25 dunums in size, has been annexed and enclosed by the settlement. This section of his land is surrounded by an electric fence, which was built about 6 months ago. It has been ten years since he used his land for growing grapes because settlers have erected a barbed wire fence inside and put up a tent that is used for vegetables. The tent has been there for about 4 years. Efrat settlement was built 27 years ago on the land of Abu Brekoot and now spans 3000 dunums. Samer Asara is intending to take his struggle to the Israeli courts to show that he has legal right to the land and the documents to prove it. Later we visited the land of Mohammed Abu Solebey on the wadi Abu Reesh. He has 200 dunums of land near the Beit Aian settlement and suffers from the settlers there. The settlers bring their sheep to his land to graze and the sheep eat the new growth on his grape vines, fruit and olive trees. 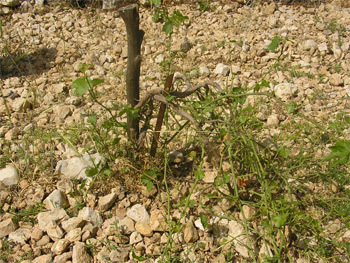 The settlers have pushed over many of the grape vines and destroyed them. He has gone to the police and they have written eight different police reports dating from 2004 to this year. On the 3rd of February last year he was severely beaten by a settler and was admitted to the hospital for his injuries.